NEW ORLEANS, LA -- At least four people were killed by massive wildfires in Tenneesee, the Gatlinburg mayor said Tuesday. Gatlinburg lost hundreds of homes and businesses in the fire. As a strong storm system approached some of the largest wildfires burning in the South, the rain signaled new hope for firefighters working to extinguish the blazes. But the storms also brought high winds, which toppled dead trees and could pose a threat to firefighters, authorities said. Experts predicted that rains Tuesday from one storm system would not be enough to end the relentless drought that's spread across several states and provided fuel for the fires. The storms early Tuesday appeared to be taking aim at the nearly 28,000-acre Rough Ridge Fire in north Georgia and the nearly 25,000-acre Rock Mountain Fire that began in Georgia and then spread deep into North Carolina. In Gatlinburg, Tennessee, emergency officials said a wildfire had set 30 structures ablaze, including a 16-story hotel, and was at the edge of the Dollywood theme park. 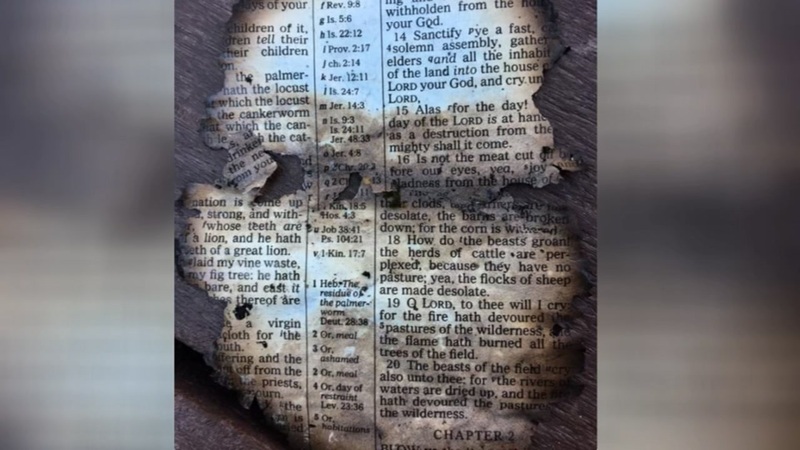 An employee of Dollywood said he had "goosebumps" after finding a burned Bible page in the aftermath of wildfires that have devastated the state. Mandatory evacuations were underway for areas in and around Gatlinburg, including the south part of Pigeon Forge, where Dolly Parton's theme park is, Tennessee Emergency Management Agency spokesman Dean Flener said in a news release Monday night. TV news broadcasts showed residents streaming out of town just as rain started to wet roads. Workers at an aquarium evacuated because of wildfires around Gatlinburg were concerned about the thousands of animals housed there. Ryan DeSears, general manager of Ripley's Aquarium of the Smokies, told WBIR-TV the building was still standing and all workers had been evacuated late Monday. However, he said workers were anxious to return to check on the well-being of the 10,518 animals. After weeks of punishing drought, any rain that falls should be soaked up quickly, forecasters said. It will provide some relief but won't end the drought - or the fire threat, they said. The storms moved across Alabama on Monday night and fell on Georgia during the overnight hours. High wind warnings were issued for mountainous areas in northern parts of Georgia.